Turkey hits back at US with tariff hikes on key products – Royal Times of Nigeria. Turkey on Wednesday said it was hiking tariffs on imports of several key US products in retaliation for American sanctions against Ankara, as a bitter dispute between the two allies that sent the Turkish lira into freefall showed no sign of ending. The lira’s fall had raised fears Turkey was on the verge of a fully-fledged economic crisis, especially in its banking system, that could spill over into Europe and other markets. 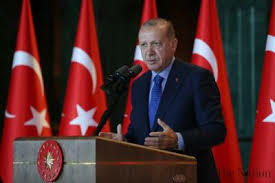 Turkish Vice-President Fuat Oktay said that the tariff hikes were ordered “within the framework of reciprocity in retaliation for the conscious attacks on our economy by the US administration”. President Donald Trump had previously announced that the US was doubling steel and aluminium tariffs on Turkey, as the two NATO allies row over the detention by Turkish authorities of American pastor Andrew Brunson. Putin ready to meet North Korea’s Kim at early date.